Akansha is a 13 year old girl. Akansha lives with her Mum and Dad and has 2 grown up sisters. Her father earns a living when work is available as a farm labourer. Financial hardship often means Akansha lacks school materials and this affects her ability to participate fully in school life. Akansha enjoys attending school and her favourite school subject is all subjects. When she is not at school she loves to read and play volleyball. Akansha travels to school each day by bus. When she grows up, Akansha wants to be a teacher. Akansha is a hardworking child who shows a lot of interest towards her studies. She is very responsible as a student and is the class prefect. Financial problems affect her educational needs. 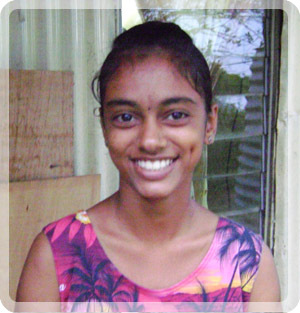 Akansha is currently looking for a sponsor to continue schooling. Akansha now receives the education every child deserves.